The photographs of Astrid Kirchherr are legendary. Capturing pictures of an unknown band called The Beatles during their stint in Hamburg between 1960 and 1962, these pictures proved to be the best set of images of The Beatles during this period and have been published many times in various books and magazines. This book, however, goes further than these images. The story of how Astrid came to take the Hamburg photographs has been documented many times. What is less known, and written about, is her time with The Beatles after they made it to stardom. Some of the most interesting pictures are from a 1963 holiday in Tenerife which Astrid attended with the boys. 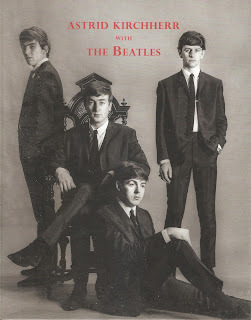 Another lesser known fact is that Astrid was invited to the filming of ‘A Hard Day’s Night’ in 1964, and the book has some excellent photographs from the set of the film. Astrid handed these negatives to Max Scheler for a magazine feature, and many of her photographs were incorrectly attributed to him. Ulf Kruger, Astrid’s manager, later rectified this error. After working on the film, Astrid and Max took a tour of Liverpool, and there are some brilliant photographs capturing life in the city in 1964. The book is a wonderful collection of Astrid’s work, and whilst there have been more extensive books on Astrid’s work, particularly by Genesis Publications, this book is an excellent collection and more affordable for most Beatles fans. I saw a copy of this while I was in Hamburg - in Gibson Kemp's bar of all places (Gibson was married to Astrid for a time). This is a great book with some rare photos - and a great price too for us mere mortals!